Road Runner Girl: Fitness Friday...Burpee BOOM Challenge! It's Fitness Friday! I'm going to give you a round up of all my workouts this week first since I haven't been listing the stats on the blog this week. Wednesday- #plankaday 2:11 and I did Bex's I Hate Burpees Challenge! Head on over and try this challenge! Bex makes it looks so easy but believe me...it's not! And since I am just beginning most of this stuff...I DID modify the side-plank leg raise to toe touch move. I only held myself up for about half the reps! Hopefully I will get stronger soon! Who's ready for a CHALLENGE??? I've said many times that I need to be challenged to stay focused on my workouts. 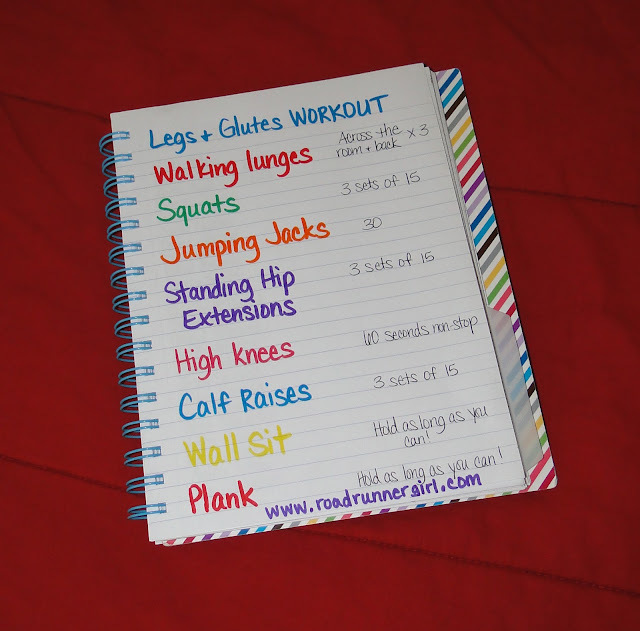 I am trying to do workouts that will make my core stronger so that I can be a better runner. That's why I started planking every day! The next exercise I want to incorporate in my routine is burpees! Yes I know most of us don't like burpees...but they are so good for you and an excellent full body workout...especially for runners! 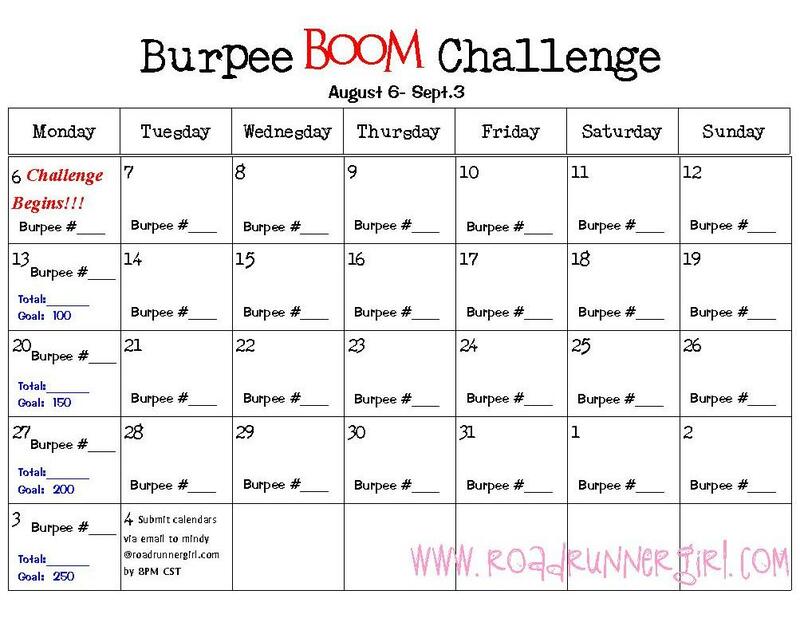 So I am hosting the Burpee BOOM Challenge!!! The challenge will last for 4 weeks....from August 6 - September 3. Week 1 your goal is to do 100 burpees that week. Week 4...250 burpees. That's brings your total to 700 burpees in 4 weeks! That's it! I don't care how you do the burpees...just that you do them! You can do some in the morning and some at night, split them into sets, do some every day, do them only 4 days a week, etc....you get the idea. I just want the total number of burpees you do for the week to match the goal for that week. And if you do more than the goal then that's great!!! A lot of you are doing a lot more burpees than this each week anyway...so adjust it to your needs! Here's the calendar for you to download and write the number of burpees you have done on the days you have done them. At the beginning of the new week (Mondays) write the total # of burpees you did the entire week in the total block. At the end of the challenge you will submit these calendars to me. I have one more prize you can win! 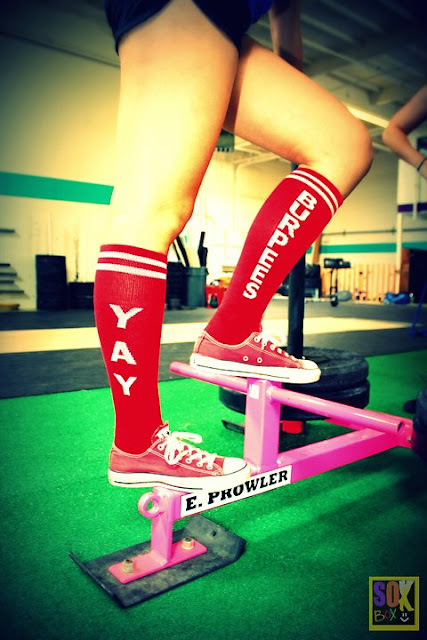 The awesome people at The Sox Box have offered to giveaway one pair of their "Yay Burpees" sox to one lucky participant of the Burpee Boom Challenge! Mandatory entry: Submit your completed calendar via email to mindy@roadrunnergirl.com by Sept. 4, 2012 at 8PM CST. Extra entry: Take a picture of yourself doing a burpee. Post the picture to Instagram and tag @roadrunnergirl @mindybobe #burpeeboom to be entered. If you don't use Instagram you can also email me the picture. Y'all should know by now how much I love pictures of you being active!!! This challenge officially ends on Sept. 3, 2012. Calendars are due to me via email by Sept. 4, 2012 at 8PM CST to be eligible for prize. A winner will be chosen via random draw and announced on Wednesday, Sept. 5, 2012. Make sure to tweet about the challenge using the hashtag #burpeeboom! Don't forget to leave me a comment below telling me you are doing the Burpee Boom Challenge!